Hot water raises your body temperature, increasing circulation. Soaking reduces your body weight by 90% (based on neck-deep immersion), relieving pressure on muscles and joints with a relaxing sensation of weightlessness. Many people experience an even greater state of buoyancy in a Salt Water Hot Tub. Powerful jets target specific muscle groups to relieve tension in your back, neck, shoulders, calves, feet and wrists. Hot Spring Spas feature the moving Moto-Massage® Jet (it feels like a dedicated underwater massage therapist) and incredible moveable/customizable jets that bring relief exactly where you need it. 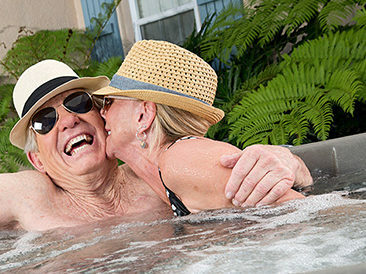 Many hot tub enthusiasts find that soaking becomes an anchor point in their life—part of a daily routine that re-sets their mind, fuels creativity and problem-solving, allows them to more readily enjoy sports and physical activity, and brings family together in a pleasant “gadget-free” zone. Curious if a home spa can suit your needs? Having your very own hot tub gives you 24/7 access to personal hydro-therapy and hydro-massage. A hot tub is a life-changing investment for your body, mind and spirit—one that pays big dividends in well-being. Spending time in a hot tub before going to bed can lead to deeper and more peaceful sleep. The National Sleep Foundation found that about 132 million Americans suffer from sleep disorders, such as insomnia, more than one night per week. Lack of sleep can leave you feeling nervous, groggy and depressed or cause erratic mood swings. Because sleep researchers believe that insomnia can be traced to hectic, stressful lifestyles, relaxing in a spa regularly can help. Many of our customers tell us that it does just that. A drop in body temperature can also aid in easing the body into a relaxing and sound sleep, according to a study in the scientific journal Sleep. Soaking in a hot tub (about 90 minutes before bed) can cause your body temperature to drop, enabling a better night’s sleep naturally—without the grogginess that sometimes accompanies prescription remedies. Best of all, with a Salt Water Hot Tub . . .
…you don’t even need to shower off after hot tubbing because the gentle spa water does not contain harsh, strong smelling chemicals. Now THAT’s relaxing! Our Hot Spring Spas are designed with gorgeous customizable lighting colors. Set your colors to change the mood. Relaxing and healing? Or energizing and fun? These spas have got you covered with easy-to-use touch screen controls. Beautiful LED color options and relaxing water features make your spa experience multi-sensory. For decades, Spas by the Bay has been helping people just like you to find the perfect spa and experience greater everyday wellness. We only carry the Hot Spring brand because we’ve found their quality standards to be unmatched in the industry. We stand behind what we sell and service. You are warmly invited to stop by or make an appointment for a no-pressure personal tour. We’re here to help you become well-educated about hot tubs so you can make the most informed decision for you and your family. Would you like to come in for a test soak to try out the jets and the Salt Water first hand?